Two years in the making, the latest title out of the EA Sports factory is UFC. With the goal of combining excellent gameplay with realistic fighters, the game seeks to break into the sports market and make quite an impact. I got some hands on time with the game, and I almost managed to forget about Bruce Lee’s giant package in the EA press conference trailer. UFC is a complete and enjoyable experience and will be a must-have for any fans of the sport. First up, the game offers a smart UI. This means that the tiles displaying the various game modes, fighters, etc adjust as you play the game. If you like to play with specific fighters, their faces will appear on the tiles. UFC offers a variety of modes. Career mode kicks off in Ultimate Fighter, letting players earn their spot in UFC. The eventual goal is to get into the hall of fame. In order to do that, you will need to learn how to fight. Challenges (another game mode) can help with that, offering practice in bite-sized pieces so that players can learn specific skills and techniques to improve their overall performance. Online play is divided into three main types: quick match, championships and rivalries. Quick match is unranked – just an easy way to play against others online but without any commitment or long-term consequences. Championships form the core online experience. With five divisions, players take part in seasons. Those seasons consist of ten fights which can be played over any period of time. All players start in the bottom division and work their way up to the top over a series of seasons. Players can also move down the divisions, ensuring that they over time they end up playing against other people who are of similar skill levels. Rivalries are similar to championships, but they’re more about challenging your friends. Seasons only consist of five games, making it much quicker to determine which of your friends are the top dogs. There are plenty of profile options with a profile page that is full of stats and infographics. These can give general information about preferred fighters, as well as fighting types and details on how you tend to lose matches. This can help players determine what they should practice in the Challenges mode to be more well-rounded fighters. At the end of a match, players can opt to send a highlight reel. If they do so, that reel will be available for others to view under UFC Spotlight. In addition to the video on demand highlight reels, everyday they will collate 10 highlight reels into a collected video, creating a top moment of the day clip. The game will launch with 98 fighters, with an ever updating roster. Bruce Lee is one of the signature fighters, and the designers even got a cast of his head to work with to ensure his likeness was as close as possible. 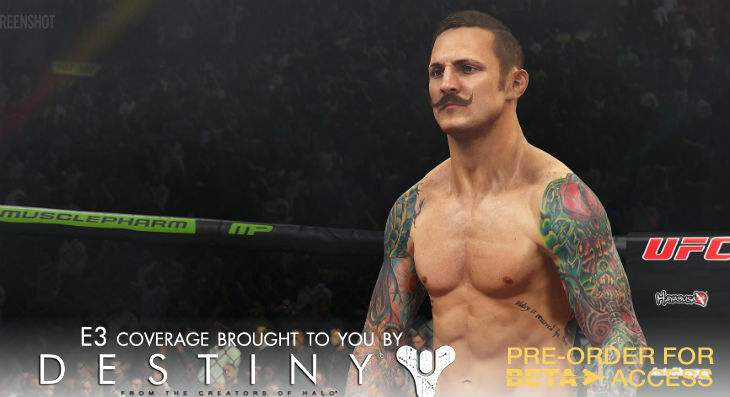 All the fighters are as lifelike as currrent technology allows, with even their pre-match shakes and bounces resembling their real-life actions. But enough about modes and aesthetics, we all know that in the end it comes down to gameplay. UFC uses stamina as its primary resource. Throw too many punches and kicks in a row, and your character will run low on stamina, making it easier for opponents to take you down and also harder for you to throw the next punch or kick. The controls are fairly intuitive with blocking mapped to triggers, attacks mapped to buttons and bumpers used to modify attacks. Unlike other fighting games that players may be used to, it’s really hard to get an opponent’s health bar down to zero. While you can do damage, and particularly make certain parts of the body more vulnerable, it’s not a matter of just throwing a few kicks and knocking out your opponent. It’s a careful dance between players, balancing stamina and impact, damage and timing. But the game is a lot of fun – it’s a unique kind of fighting and sport game, and I think it could appeal to a variety of players in the EA Sports world.